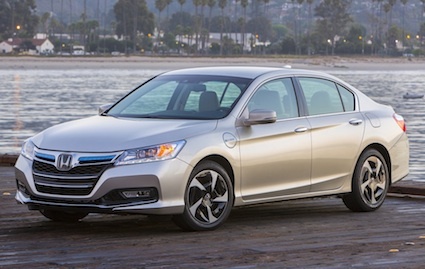 Subtle styling differences define the Honda Accord PHEV. The Honda Accord Hybrid is back and this time it comes in both plug-in and standard hybrid configurations. The standard hybrid will be produced in the United States and go on sale this fall, while the PHEV hybrid is already available, a 2014 model that went on sale at select New York and California dealers on Jan. 15. This midsize, front-wheel-drive sedan offers segment-leading fuel efficiency, besting the Ford Fusion Energi, the Chevrolet Volt and Toyota Prius PHEV models. The newest Accord model retails for $39,870 and can travel 13 miles on electric-only power. Its EPA combined MPGe rating is 115 MPGe, while its fuel economy rating is 47 mpg around the city and 46 miles on the highway. A federal tax credit may also available apply. The new model uses Honda Earth Dreams technology, a two motor system that works with a 2.0-liter four cylinder gas engine to power the sedan. A 124-kilowatt electric motor does double duty as a continuously variable automatic transmission and is assisted by a lithium-ion battery pack. Regenerative braking also contributes to the electrification process. Drivers can move between an all-electric EV drive, a gasoline-electric hybrid drive and a direct energy drive with two additional modes available to serve their commuting needs. The default start mode for the Accord PHEV is all-electric, switching automatically to gas/electric hybrid mode when the battery state of charge reaches a bottom threshold level. A center console button enables drivers to choose EV-only mode, ideal for jaunts around the neighborhood or an HV mode that allows for regular hybrid operation. With the latter, the battery’s charge level remains constant. Honda says that the PHEV Accords battery can be full charged in less than three hours using a conventional 120-volt household outlet via the sedans equipped cord. Charging time comes in at less than one hour when a 240-volt Level-2 charger is used. A smartphone app enables owners to monitor the charging state remotely as well. Accord PHEV shoppers will find a car that matches the Accord Touring trim level while offering its own styling cues, especially evident across the grille. The new model is available in three shades including burnished silver metallic, the latter unique to the PHEV. With limited distribution and a small number of models to offer at first, the Honda Accord PHEV will serve as a halo product for its EV fleet. The real test for Honda comes when the Honda Accord Hybrid is released, a model that will be built at its Marysville, Ohio plant, joining the Insight and Civic Hybrid when it goes on sale this fall. Photo courtesy of American Honda Motor Co. Inc.